One of the six IB approaches to teaching is that it is inquiry based. This supports the description of the IB learner as 'inquirer' in the IB Learner Profile. But what does it mean to inquire? What does it mean to say that a student inquires? What does it mean to say that a teacher's approach is inquiry-based? Is it about seeking answers or seeking questions? Or is more about investigating, a way of thinking and a way of learning? A workshop which could be led as a Genius Hour since it contains multiple links to a wealth of resources. You may like to read this page in conjunction with Professional Inquiry in which we look at the staff faculty as professional inquirers. Are you a curious person? When? What are you curious about right now? Why is it important to be curious? How do we ignite curiosity in our classrooms? What is inquiry-based learning and how can it be implemented? How is inquiry-based learning different from other approaches to learning? How can teachers demonstrate inquiry-based learning? How can teachers be supported in their inquiry-based learning? Inquiry is “a stance that underlines our approach to living as learners.” It is about the learning process as opposed to being a teaching method (how you teach). It is a process of going beyond what you already know and experience and asking ‘why’ and ‘what if’. In this sense the curriculum itself is an inquiry. This contrasts with a view of curriculum experienced as fact learnt through a textbook with right answers. Inquiry is natural to learning – you only have to observe young children inquire as they engage with life, immersed in what is happening around them until something catches their attention and raises their curiosity. So how do we create learning environments that immerse learners in the process of inquiry, rather than in how we think they should learn? Inquiry is also conceptually-based, rather than topic or information based. It is about identifying the big issues, being able to pose questions about them and then to try and solve problems. The move from trying to solve problems to actually posing questions makes the distinction between guided inquiry, collaborative inquiry and personal inquiry. Guided inquiry is where the teacher is the problem poser and the student’s problems solvers. Collaborative inquiry is where teachers and students collaborate on problem-posing and problem-solving through a process in which both teacher and students negotiate about the curriculum. Personal inquiry is where the student is both problem poser and solver pursuing personal interests. Inquiry is also something you do in a collaborative way. Collaborators may be teachers and fellow students or/and virtual – authors with whom we think in books or on internet sites. In collaboration we think together (not just work together) through dialogue about ideas. Kathy Short, University of Arizona, Inquiry as a stance on curriculum, in Taking the PYP Forward, ed. Davidson, S., and Carber, S., 2009. Kathy Short has designed an Inquiry Cycle for teachers to develop this inquiry stance. Click here to access it. It is a useful planning tool. “When we seek to make sense of the world around us, we wonder, we plan, we analyse, we create, we reflect. At its very heart, inquiry is all about thinking – thinking in order to make meaning.” The inquiry process develops students’ understanding by guiding their thinking from facts through to concepts and then to higher level generalizations. Kath Murdoch, University of Melbourne, Inquiry learning – journeys through the thinking processes. Kath Murdoch has designed an integrated inquiry planning model (2010). Click here to access it. It is a useful planning tool. Curiosity helps to excite inquiry. Inquiry-based learning often uses central questions to frame learning. It uses the learners' questions, interests and curiosities to drive the learning and therefore encourages them to develop their own agency and ownership of the learning. Sometimes learners are encouraged to pursue their questions and interests through personal projects. At other times the teacher or facilitate will frame the inquiry around key questions that arise from units of work. Below we provide an example of how inquiry is at the heart of framing rich inter-disciplinary tasks. The role of the teacher is very much that of the facilitator guiding the learner in their inquiry and exploration. WHY is inquiry-based learning important? Activity 1: Why is it important to inquire? Warren Berger's A More Beautiful Question presents his research on the importance of questioning but also the sad decline of questioning as children get older. Although a long video it is worth watching it when you have time. Inquiry-based learning is about growing inquiring minds. It encourages engagement with learning which leads to deeper understanding. Inquiry-based learning places the learner centre-stage - they learn not by receiving knowledge and information from another person but by discovering as they go. Inquiry-based learning is a form of experiential learning. People learn by doing, by inquiring. Inquiry ignites passion in a subject, develops student ownership of a subject and thus inspires relevance. Research shows that curiosity is as important as intelligence in determining how well students do at school.This research informs us that curiosity prepares the brain for learning. If the right question is posed it creates curiosity which puts it in a state of alert. Furthermore, “not only will arousing students' curiosity help them remember lessons that might otherwise go in one ear and out the other, but it can also make the learning experience … pleasurable”. Curiosity stretches us internally - the British philosopher Betrand Russell said "Questions enlarge our conception of what is possible (and) enrich our intellectual imagination. (The Value of Philosophy)"
Questioning is a highly valued skill in the world. We live at a time when the number of global issues which need to be solved is growing. Our society needs people who are able to inquire - to ask questions, seek answers and create solutions. Companies require people to ask deep questions that will solve real problems in the world. Technology makes inquiry based learning even more important. The role of technology in changing our understanding of knowledge and how it is constructed has been dramatic and significant. When I was a child in school knowledge was almost canonical, handed down from teachers in an authoritarian and unquestioned way. Examinations were largely a matter of regurgitating a lot of this knowledge. Even at university so much knowledge was transmitted through attending lectures, reading learned tomes and then writing and presenting papers in which I cited learned scholars. My IQ was to a large extent equated with knowledge acquisition and my education complete once I had finished school and then university. The world-wide-web has changed all of that. Consider the invention of Wikipedia, described as the 'free encyclopedia that anyone can edit'. Here knowledge is not absolute but is constructed in conversation with others across multiple disciplines. Being educated is not a matter of rote learning but inquiring and researching. Everyday people do this when they are searching for the best energy deals or holidays. Inquiring and asking questions is valued. We talk about learning being a lifelong quest in which we are expected to be active and collaborative learners, constructing knowledge and meaning together. It was the Irish poet William Yeates who said that "Education is not the filling of a pail, but the lighting of a fire." The former - the filling of a pail - best describes a lot of my education forty years ago. The lighting of the fire is a reasonable description of inquiry based learning for today in which we weave knowledge together with other people. Inquiry-based learning in The Diploma Programme: From principles into practice (2015, IB, pages 68-69) It can be accessed via the IB Online Curriculum Centre. Use the Genius Hour protocol to explore what inquiry looks like. Below I have included key points with many links. You may also like to dig deeper by referring to the links at the bottom of this page. Consider the following: What does it mean to be an inquirer? What are the pre-requisites for inquiry-based learning to happen in classrooms (e.g. teacher and student attitudes etc.)? What does inquiry-based learning look like in the classroom - what would you See, Hear, Feel? What can some of the challenges be for the inexperienced (and the experienced) teacher? How might you implement an inquiry-based approach to learning within a national education context that adopts a very different style of learning? How might you sustain an inquiry-based approach to learning within an educational context that places a lot of emphasis on high stakes assessment and testing? What do you need to do in your own school to improve the quality of inquiry in your classrooms? Collect a few action points. What are your currently reading about teaching and learning? Why? How (blog, book, educational journal, twitter etc)? Use the See, Hear, Feel protocol to summarise your work - i.e. what does inquiry look like, sound like or feel like? Where is the learning happening? Who is in charge of the learning? Inquiry-based learning often centers learning on solving a particular problem or answering a central question. Scaffold and value questioning - question starters, stems, strategies. Encourage students to notice their learning - how we learn what we learn and how we can improve our learning. Learning is something the learner does - not what which is done to them - build learning power. Assignments - do they focus on complexity and justification? Engage, Explore, Explain, Extend. Click here. HOW do you develop an inquiry-based approach? In his article Creating a culture of Inquiry Andrew Miller explores how to develop a culture of inquiry in your school. He explores (a) the importance of creating a welcoming culture in which students feel safe and valued in asking questions; (b) scaffolding the process of asking questions through the use of structured protocols which can be taught and learned; (c) designing essential open-end questions based on a thorough knowledge of your students, their interests and aptitudes; and (d) ensuring assignments mirror the inquiry-based approach. He ends his article with a helpful warning: "A culture of inquiry can only become the classroom norm if there is commitment from all stakeholders -- parents, students, teachers, administration, and more. Simply saying that we are an inquiry-based classroom and doing an occasional inquiry-based activity is not indicative of a culture of inquiry. Although this is a great first step, we need to reinforce this culture throughout the year by creating both instruction and assessment that value inquiry." In his blog Bringing Inquiry-Based Learning Into Your Class Trevor MacKenzie recommends a scaffolded approach to developing inquiry in the classroom so that student agency gradually increases. His four-step approach gradually increases student agency through structured inquiry (in which the teacher is in charge of the essential question and specific learning activities), to controlled inquiry (in which the teacher provides several essential questions), to guided inquiry (in which students select resources and assessment) to free inquiry (which allows learners to construct their own essential questions). Activity 3: How do you embed an inquiry approach into all that you do? Subjects as focus of inquiry: Ask subject teachers: 'why are you teaching your subject?' (e.g. what does it mean to be a scientist, a historian, a mathematician?). What are the three big questions your subject is trying to address? Inquiry questions: Within each subject: are unit plans driven by inquiry questions? Learner Profile: How are you embedding and nurturing the development of the attributes of the learner profile within your subject, across the school? Are you living out the attributes of the learner profile as a school? How do you know? What is the impact? School action plans: are these framed in terms of lines of professional inquiry? Inquiry led performance management: how do you set performance management objectives for each of your staff? Could these objectives be framed as lines of professional inquiry? Rich Tasks are open-ended inquiry based tasks and projects that connect the learner to problems to be solved in the ‘real world’. The Rich Tasks are extended performance tasks that combine subject areas. Although originally an assessment tool devised by Queensland, Australia, Rich Tasks are used by a number of educational jurisdictions as a framework for designing a block of work using a number of academic disciplines to inquire into a specific question. Rich Tasks are engaging because they are associated with real problems and topics. They are challenging and involve active thinking and doing to work through. Rich Tasks encourage originality and invention as well as the making of judgements. A helpful short introductory video to rich task methodology can be found by clicking here. A background paper on Rich Tasks can be read here. A short think piece on rich tasks can be accessed by clicking here. What is inquiry? A very helpful summary of what inquiry-based learning is can be found by clicking here. Inspired Issue Brief: Inquiry-Based Teaching - a very helpful briefing on inquiry-based teaching. Click here. Inquiry-based learning needs to be carefully structured. Kirschner, P.A., Sweller, J., & Clarke, R.E.,provide a clear argument on why inquiry based learning needs to be structured in their article Why minimal Guidance During Instruction Does Not Work: An analysis of the failure of constructivist , discover, problem-based, experiential, and inquiry-based teaching. Click here to access it. Click here for Kath Morgan's integrated inquiry planning model. 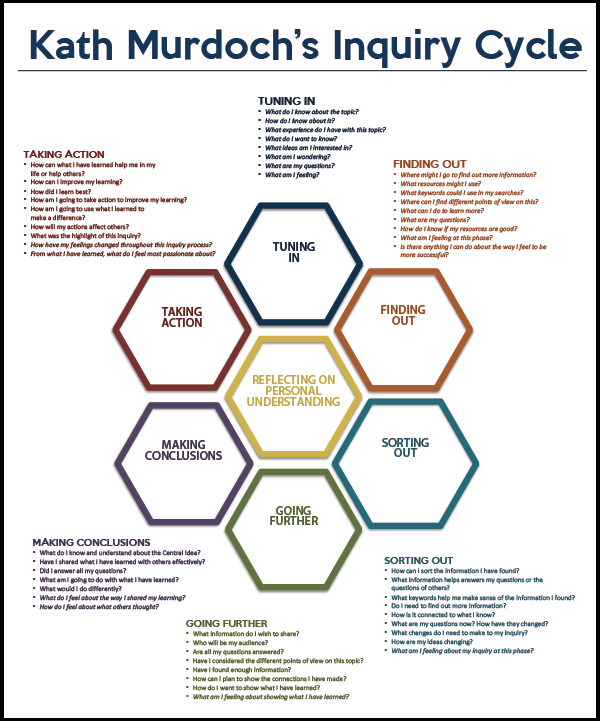 Click here for Kath Morgan's tool for planning the phases of inquiry. Click here for Kath Morgan's inquiry cycle. Click here for an assessment rubric from the Galileo educational network for judging whether the various aspects of inquiry are 'beginning, developing, emerging or aspiring'. Click here to find a quick description of professional inquiry from the blog Inquire Within. Click here to access What Ed Said's blog on What does it mean to have an inquiry stance in our teaching? A very good collation of resources and downloads to facilitate inquiry-based learning has been collated by edutopia. Click here to enter the edutopia site. Teaching for Meaningful Learning: A review of research on inquiry-based and cooperative learning, Barron, B & Darling-Hammond, L., Edutopia. Click here to access the document. Why it's imperative to teach children to question as the ultimate survival skill, Mind/Shift. Click here. There is an excellent article containing the first chapter of John Barrell's Developing More Curious Minds. Click here to access it. It contains good real life stories of when questions went unanswered which resulted in tragedy ensuing. These stories are good for use with high school students to encourage them to have a critical and curious mind - to keep asking the questions, even when it may make them unpopular. Focus on inquiry is an excellent guide produced by the Galileo Educational Network. You can access it on line. However, beware that I had problems trying to download it although they do say you can do so. ATT in the IB Diploma: A Literature Review of Teaching Practices for Effective Learning, L.G.King (2013) ha a good overview of different methods of teaching nquiry: experiential learning, problem-based learning, case-based learning and discovery learning. In his article for edutopia, Dr. Richard Curwin, reflects on why he has never opened an instruction book when he bought a new product. "I realized that I did the same when I bought a new car -- with one exception. I never read the instruction book in the glove compartment. I just turned on the engine and drove off. I already knew how to drive, so I didn't need a book. The exception occurred when I tried to set the clock. I couldn't figure it out, so I finally opened the glove compartment and checked the book. This pattern was and is true for every device I buy. I never read the book that comes with a toaster, an iPod, or a juicer unless I have a question. There are some people who do read instruction books before using a device, but with no disrespect intended, those people are a small minority. Our minds are set up to not care about answers unless we have a question. The greater the question, the more compelling it is, the more we want the answer. We learn best when questions come before answers. Too many classrooms ignore this basic learning model. They spend most of class time providing information and then ask questions in the form of a quiz, test, or discussion. This is backward. Too many students never learn this way. It is simply too hard to understand, organize, interpret, or make sense out of information -- or even to care about it -- unless it answers a question that students care about. Lessons, units, and topics are more motivating when they begin with a question whose answer students want to know." ^ Four phases of inquiry based learning. Teach though Click here. ^ Eisner, E. (2004) What can education learn from the arts about the practice of education? Dewe lecture to Standford University.